Welcome to the friendly Howard Johnson Inn & Suites Disneyland! We're very close to all major attractions including the fabulous Disneyland Resort. We are located in the heart of Orange County, our Howard Johnson Inn and Suites – Orange hotel near Disneyland is the perfect spot to stay during your vacation in the sun. Our Orange, California, hotel is within walking distance of area attractions and restaurants, making for a relaxing fun and comfortable stay. Wake up with free Rise & Dine continental breakfast, and go for a swim in our outdoor pool. Before you go to the beach, check your email with free high-speed Internet access, or make your snack/meals for the day using your in-room microwave and refrigerator. Our hotel offers laundry and valet services, free parking and 24-hour front desk service. 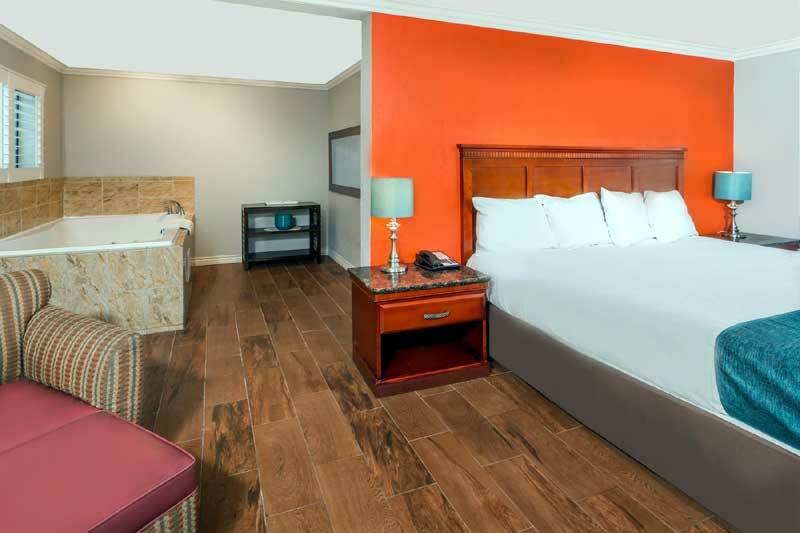 Non-smoking rooms, business rooms and Jacuzzi suites are available at our hotel in Orange, CA. For a day of fun and being in the sun, take a short drive to Newport Beach. Spend a magical afternoon and memorable evening at Disneyland, where you can visit Cinderella’s Castle, rocket into outer space on Space Mountain or stroll down Main Street, U.S.A. right next door, Disney California Adventure Park features the California Screamin’ roller coaster and the Twilight Zone Tower of Terror. If you require more adventure, Knott’s Berry Farm offers thrilling rides, kiddie rides and a water park. Catch a game at nearby Angel Stadium of Anaheim, home of the Los Angeles Angels baseball team. If you love to shop till you drop, spend an afternoon browsing the variety of stores at Irvine Spectrum Center – there’s something for everyone. The state-of-the-art Anaheim Convention Center is just minutes from our Orange, California, hotel. Try some fresh sushi and authentic Japanese dishes at Koisan Japanese Cuisine Restaurant or seafood specialties at Tandoor Cuisine of India Restaurant, both just a short drive away. For a fast bite to eat, visit Round Table Pizza or Five Guys Burgers and Fries, also within easy driving distance of our Orange, California, hotel. Activities : Play at the beach. Explore art, history and culture. Dine at award-winning restaurants. Listen to live entertainment. Catch a professional sports game. Swing for par on a breathtaking golf course. Whatever you choose, you'll feel like you're walking on sunshine in Anaheim and Orange County! Airport : John Wayne Airport The Airport Improvement Program is underway with major construction of a new Terminal C, Parking Structure C and the Central Utility Plant. Passengers and visitors to JWA will notice a significant amount of construction activity in and around the Riley Terminal. Please exercise caution due to ongoing construction activities and periodic lane closures. Attractions : Explore, play, and discover The OC! There are more attractions in Orange County than there are in most states. From world-class fairs and parks to interactive learning centers and historic sites. The OC has enough amazing activities to fill your entire vacation. There truly is something for everyone here in sunny Southern California. Attractions : Disneyland Resort Welcome to the place where imagination is the destination ! For young and old, big and small — it's the happiest place on earth! Business : Anaheim Convention Center 800 West Katella Avenue, Anaheim CA 92802 (714) 765-8950 Fax: (714) 765-8965 About the Anaheim Convention Center Anaheim first became a meetings and conventions destination in 1967 with the construction of the domed Arena which stands on Katella Avenue. Dining : Your dining experience in Orange is unique – from the elegant to the casual. You can dine at the top of the heights overlooking a sea of lights or keep it simple at one of several historic restaurants in town. A wide range of food is offered at our restaurants so whatever appeals to your taste, you can find in Orange. Want to find a great place to dine right now? Golf :Orange County Golf Courses Play stunning, picturesque ocean courses with dynamic views of the majestic Pacific Ocean, challenging links-style courses in the valleys and exciting winding courses nestled in the foothills in the best year-round golfing weather in the world! Government : The City provides a full range of services for its citizens. These services include police, fire, paramedic, emergency transportation, library, recreation and parks, planning and development, street improvements and lighting, and general administration. Hospitals : St. Joseph Hospital is a values-based Catholic health care provider with a tradition of and commitment to excellence, based on the vision of the Sisters of St. Joseph of Orange. The hospital's strong belief in the intrinsic dignity of each person commits it to be a just employer to its 3,800 employees; to provide healthcare for the whole person, body, mind and spirit; and to collaborate with the 1,000-member medical staff and other healthcare providers to increase access to quality health care. Shopping : Experience Orange County's sophisticated-yet-relaxed signature style by shopping the wide array of unique boutiques, ethnic shops, and exclusive designer flagships. Southern California's Riviera is waiting to envelope you in its iconic, glamorous lifestyle... what are you waiting for? University : Anaheim University is a pioneering online institution of higher learning founded in 1996 with its administrative offices located in Anaheim, California. Anaheim University is accredited by the Accrediting Commission of the Distance Education and Training Council. The University, through its state-of-the-art online face-to-face learning environment, provides opportunities for students around the globe to interact with the most renowned experts in their fields allowing them to both further their knowledge and advance their professional skills in a user-friendly and interactive environment. Anaheim University offers online programs in English teacher education, business administration and sustainable management.